Who were the Neanderthals? 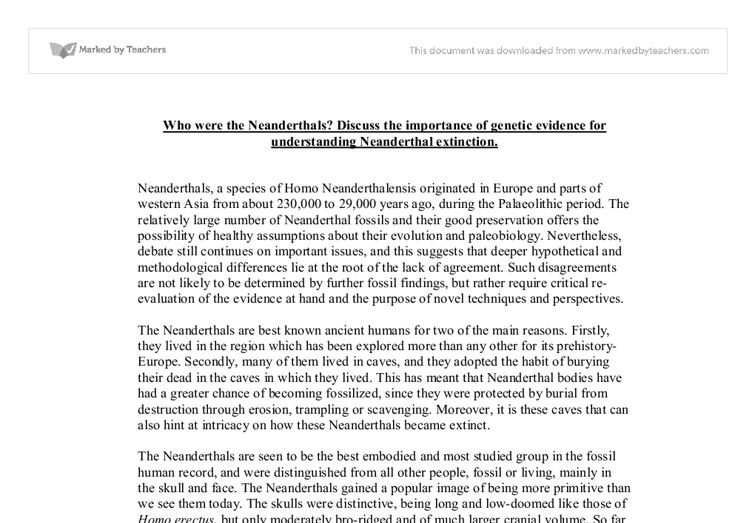 Discuss the importance of genetic evidence for understanding Neanderthal extinction. Neanderthals, a species of Homo Neanderthalensis originated in Europe and parts of western Asia from about 230,000 to 29,000 years ago, during the Palaeolithic period. 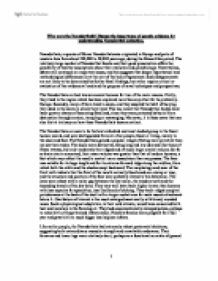 The relatively large number of Neanderthal fossils and their good preservation offers the possibility of healthy assumptions about their evolution and paleobiology. Nevertheless, debate still continues on important issues, and this suggests that deeper hypothetical and methodological differences lie at the root of the lack of agreement. Such disagreements are not likely to be determined by further fossil findings, but rather require critical re-evaluation of the evidence at hand and the purpose of novel techniques and perspectives. The Neanderthals are best known ancient humans for two of the main reasons. Firstly, they lived in the region which has been explored more than any other for its prehistory- Europe. Secondly, many of them lived in caves, and they adopted the habit of burying their dead in the caves in which they lived. This has meant that Neanderthal bodies have had a greater chance of becoming fossilized, since they were protected by burial from destruction through erosion, trampling or scavenging. Moreover, it is these caves that can also hint at intricacy on how these Neanderthals became extinct. The Neanderthals are seen to be the best embodied and most studied group in the fossil human record, and were distinguished from all other people, fossil or living, mainly in the skull and face. ...read more. If this disputed date is accurate, it means that the Neanderthals apparently survived in Southern Spain long after they had disappeared further north and even longer after the appearance of the first modern people in Europe, some 40,000 years ago. Further dates from other sites in Gibraltar, southern Spain and Portugal appear to support this scenario of late Neanderthal survival in pockets, and in this context, areas like mountain ranges and even Britain could have provided refuges. There are comparably late dates from regions such as Croatia, the Crimea and the Caucasus. While the Neanderthals of southern Iberia sustained to make typical Middle Palaeolithic artefacts, other Neanderthal groups did start producing more advanced stone tolls, bone tools, and apparently even necklaces and pendants during their period of coexistence with the Cro-Magnons for example, the makers of the Chatelperronian in France and northern Spain, and of the Uluzzian in Italy. Some experts believe that this is a sign of contact or trading between the two populations, while others believe it indicates technological competition between them for the available resources, competition which drove the Neanderthals to modernization and social change. Yet others argue that the Neanderthals were developing these advances independently, even before the Cro-Magnons arrived. It is possible that many different kinds of interactions would have been possible, ranging from warfare, through avoidance, to peaceful coexistence, trade and even interbreeding. Given what we know of human behaviour today, any of these could have occurred, and indeed perhaps they all did at certain times and in certain places. ...read more. This was the only one progression from one Neanderthal fossil. Studies also point that the Neanderthal mtDNA sequence supported the fact that modern humans arose recently in Africa as distinct species and replaced Neanderthals with little or no interbreeding. But they pointed out that other genes might tell somewhat different stories. This is surely likely because mtDNA is only inherited through females. So any genetic heritage passed on from Neanderthal males to present-day populations, for example, would not be recorded in that particular DNA. However when put together with an increasing body of fossil research showing the distinctiveness of the Neanderthals, it appears that they could have had only a minimum genetic contribution, at best, on the modern populations that succeeded them. In relevance to the question it is reasonably clear that the importance of genetic evidence for understanding Neanderthal extinction is essential. It not only allows an understanding to the possibilities of what led to their extinction, but it also supports the information on how these genetic traits may have been passed down and as a result became extinct through modern humans. On the contrary view however, competition for resources as survival of the fittest were also found as important evidence that may suggest their disappearance where other homo sapiens began occupying areas and it became difficult for both species to compete for the same resources. Both views are taken acutely, which suggest that both genetic and fossil evidence have equal importance in helping us to understand Neanderthal extinction; through their genetic make-up, physical attributes, environmental roles and psychological differences. ...read more. The ink particles float to the surface. There are reports that this process is facilitated by addition of cellulase enzymes. In paper making enzymes are used especially in modification of starch, which is used as an important additive. Starch improves the strength, stiffness and erasability of paper. Patients always are deficient in protein dystrophin which is a major protein for protecting muscles. It plays a mechanical role by linking the cortical actin cytoskeleton to the extracellular matrix. The most/only common forms of muscular dystrophy are DMD and BMD. 1in 3 billion statistic of coming from anyone other than the suspect sampled is in reality an extrapolation from a test pool based on allele frequencies from a given population. The FBI maintains a database of population statistics separated by ethnicity that is available to laboratories performing DNA typing. Children conceived with an Rh positive husband could receive the rhesus factor from him. The mother's body, which doesn't have it, perceives the new factor as an invader, like a cold virus, and starts building defenses against it. This usually happens during a first pregnancy with an Rh positive child. stated a principle which they call the Genetic Principle, the principle is as follows: "Genetic Principle: Genetic diversity, in both human and nonhuman species, is a precious planetary resource, and it is in our best interests to monitor and preserve that diversity."